to inform and guide you through the raising of your puppy of course also after the purchase. We are one of the best european breeders for harlekin great danes. 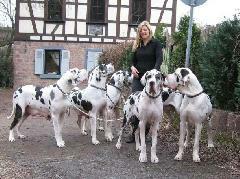 Our danes got many champions and win many european dog-shows. All puppies from our breeding receive a written 2-years health guarantee! of course including FCI-export pedigree, all nesessery paperwork for the flight and transport to the airport, shots and deworming. Each puppy has a micro-chip, a health-check before leaving and additionally a 2-year health-guarantee in writing. Worldwide shippment costs approximately 700 - 900 EUR for a 9 weeks old puppy. If the puppy needs to stay longer the flight costs will become higher and we have to charge a kennel tax of 300,- Euros per month. We have very good experiences with the company pet-air. They are located at the Frankfurt/Main airport and specialized in the transport of domestic animals. The room in the airplane is air-conditioned and there's always an animal keeper who takes care of the puppies during the flight. All Great Danes from our kennel are of course x-rayed for hip dysplasia and their good-natured character has been examined by breeding judges. We provide purchasers of our puppies with a 2 year health guarantee, for serious genetic illnesses. This health guarantee does not include death or illness from viruses that the puppy may contact after it is placed with the buyer, for example the parvo virus, or from death or illness during shipment of the puppy to the buyer. Since certain health problems, such as hip or elbow dysplasia, may result from feeding or exercise decisions made by the buyer after shipment of the puppy, this guarantee does not include hip or elbow dysplasia. However, the German government certifies all Great Dane breeding pairs, to make sure there is no genetic history of hip or elbow dysplasia in either the sire or dam before breeding is authorized. Any dispute as to the 2 year health guarantee must be adjudicated in Frankfurt Germany, pursuant to German law.